I’m 100% positive the best part about being a food blogger is the friends. I can’t believe how many great people I’ve become close to over the last year. Friends who would invite me into their homes and feed me type of people. The best kind in my opinion! Veronica is one of those friends. She came into my life when I wasn’t food blogging yet. Finding me, and my early pathetic food photography attempts on MySpace when I was first learning to shoot food. Veronica’s been making me laugh and encouraging me for nearly two years since. When I finally set up this food blog, she jumped right in and edited my posts. I didn’t even have to ask! She just knew she could help and did. Veronica also knows my weakness for Oreos. She recently sent me a giant (but evil) box of these Oreo Truffles. This post is her’s, and every time I read it I laugh. The photograph above is what was left from the box. Now she owes me money for bigger pants. How the heck did I get so lucky to have a Veronica in my life? Veronica thank-you for the truffles, the friendship, and the fun! Melt the chocolate almond bark according to package directions and dip each truffle in the chocolate with a fork. Tap the excess chocolate off and use a second fork to push the coated truffle onto the waxed paper. Sprinkle cookie crumbs onto the chocolate while it is still wet. Continue until all the truffles are coated, leaving half uncovered if you wish. 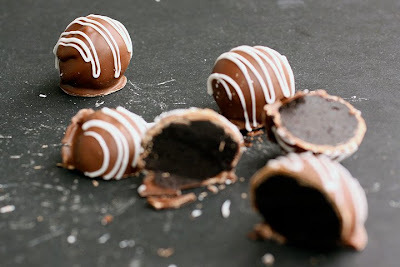 Original Oreo Truffle Recipe may be from Kraft.com. Post content by Veronica Miller. Visit and say hi to Veronica at her blog Recipe Rhapsody. Top shot by Laura Flowers. This truffle does sound & look like a bite of heaven! My mother's favorite cookie is an Oreo & frankly by osmosis I am rather partial to them as well. Thanks for posting this wonderful recipe! Yummy! I've had these and they are addictive. Now I have to try the rolo crack and bigger pants. A truffle everyone is sure to love! My roommate made these for Christmas, except he used mostly white chocolate. It's some good stuff. I love this story - and the picture looks amazing! Very cool story of 2 friends and a truffle! Just sinful!! Friends certainly are a perk of food blogging :) They just don't realize the favor they are doing us, so that we don't eat everything we cook! LOL! I love Oreos (without the apostrophe hehe Hey, you asked for editing help!)!!! I've seen these Oreo Truffles and still haven't tried them. I don't know why; they look so good!! Nice photos, Veronica!! I have seen these on a few blogs and they look better and better, but yes, they could be dangerous...just the right size for popping in your mouth! Laura, what a fun package to receive in the mail! The truffles look divine. I don't need anymore sweets in my diet but this one ...!?!? hm.. they look great maybe I will indulge just once. Thanks for sharing! Well, since I still haven't lost the Rolo-crack weight, I figure we're even, so I'm not paying you a dime! LOL! I enjoyed this post and am honored to have it dedicated to me. I feel the same about you and thank you as well for being such an encouragement and great friend. You rock! I had never tried these before until my sister made them for Christmas this year - They are delish!!! I weep with joy over this blog post. What an inspired use of Oreos! These look absolutely divine! I hope I don't make them and eat them all before I can share...or not. Laura, I totally agree with your comments about food bloggers becoming great friends. In the nearly 2 years I've been blogging, I've met & become friends with some of the most lovely people in the world. I think anyone who loves to cook, bake & care for others (and blog about it too) is genuinely kind and sharing. Blessings I never expected when I started Inn Cuisine. Well, these look absoultely wonderful- like how can you keep from eating the entire plate? Beautiful pictures. I love these things!!! But they certainly didn't come out looking THAT pretty! wow! I can't wait to try these. They look delish! Love your blog!!! Laura, these look and tast wonderful. I first started making them about 2 years ago. Glad to see this recipe making the rounds! I just learned of this recipe this year and it is an instant fave. We especially like using the mint oreos and then dip them in green tinted white almond bark. A tip for dipping: Freeze for about 20 minutes, then insert toothpicks into the bottom and dip, and then insert the toothpick into wax covered foam (we found some foam from a previous appliance box). The chocolate rolls off smoothly when they are cold and using the foam, you won't have any flat bottoms and just a tiny hole where the toothpick was inserted. Making more tomorrow along with the Rolo "crack" (appropriately named). Who cares about the waistline - it's the holidays!